A350 of Air China Completes Maiden Flight. 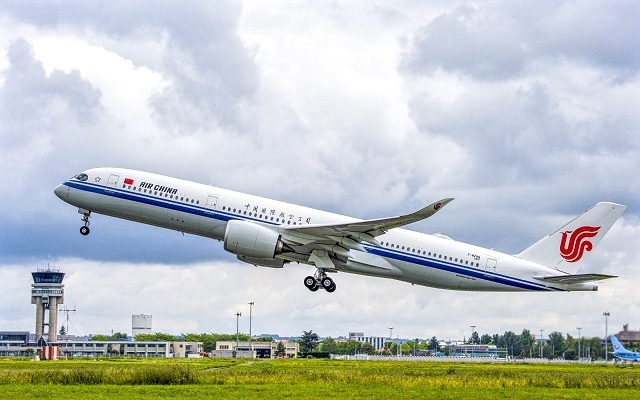 Air China's first Airbus A350-900 made its first flight in Toulouse. The aircraft, painted in the carrier's blue and red livery, will enter the final phase of production, with more ground controls and test flights to be carried out before preparing for delivery, says the manufacturer. The plane registered as MSN 167 is scheduled to be delivered to the airline in mid-July. However, it is not clear if this will be the first A350 to be delivered to a carrier from mainland China. Air China was the first carrier in mainland China to order the A350. It has 10 of the jets powered by Rolls Royce Trent XWB in order. China Eastern Airlines and China Southern Airlines have orders for 20 A350-900. Sichuan Airlines will take two of these types, one each from the lessors AerCap and Air Lease Corporation, while Hainan Airlines will take four: two each from AerCap and CIT Leasing. A plane for Hainan Airlines, MSN 098, is scheduled to be delivered in mid-June. By bringing new levels of efficiency and comfort in the long-range market, the A350 family is especially well suited to the needs of Asia-Pacific airlines. To date, firm orders from the A350 family of carriers in the region represent more than one third of the total sales of the type. The A350 XWB features the latest aerodynamic design, fuselage and carbon fiber wings, as well as new Rolls-Royce engines with low fuel consumption. Together, these latest technologies translate into unprecedented levels of operational efficiency, with a 25% reduction in fuel burn and emissions, and significantly lower maintenance costs. As a founding member of the "Airspace by Airbus" cabin brand, the A350 XWB cabin offers passengers and crews the best in comfort, well-being and technology. To date, Airbus has registered a total of 832 firm orders for the A350 XWB from 45 customers worldwide, making it one of the most successful wide-body aircraft in history.